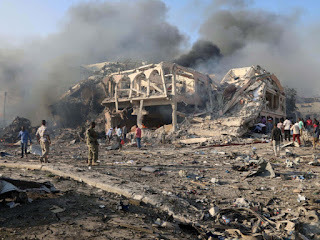 At least 231 people have been killed after two bomb attacks struck Somalia's capital Mogadishu in the deadliest attack the country has ever seen. Senator Abshir Abdi Ahmed says 275 others were injured, citing doctors at hospitals he has visited in Mogadishu. A truck bomb exploded on Saturday outside a hotel at a busy intersection that is lined with government offices, restaurants and stalls, destroying buildings and setting cars on fire, police said. Two hours later, a second blast struck the city's Medina district. Doctors are struggling to assist hundreds of wounded victims, with many burnt beyond recognition, according to reports. "The hospital is overwhelmed by both dead and wounded," said Dr. Mohamed Yusuf, director of Medina hospital. "We also received people whose limbs were cut away by the bomb. This is really horrendous, unlike any other time in the past." A mother of four, Zainab Sharif, lost her husband. "There's nothing I can say. We have lost everything," she said. President Mohamed Abdullahi Farmaajo has called for donations of blood as he declared three days of national mourning. The local ambulance service tweeted pictures of the scene, saying: "In our 10-year experience as the first responder in Mogadishu, we haven't seen anything like this." Local journalists say one freelance journalist was killed and several were injured. The International Committee of the Red Cross says four volunteers with the Somali Red Crescent Society are also among the dead. "This figure may rise as there are a number of volunteers still missing," it said in a statement. The United States has condemned the attack. A statement by the US mission to Somalia says that "such cowardly attacks reinvigorate the commitment of the United States to assist our Somali and African Union partners to combat the scourge of terrorism". Somalia's government has blamed the attack on the al Shabaab extremist group, which has not commented. Mogadishu is often a target for extremist group al Shabaab, which is allied to al Qaeda.